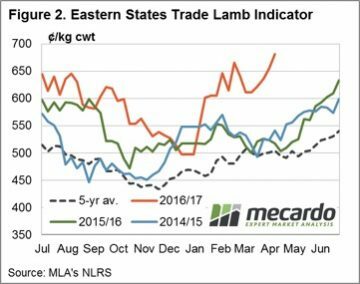 The Eastern States Trade Lamb Indicator (ESTLI) hit an all-time high this week at 681¢/kg cwt encouraging a lift in throughput, particularly out of Victoria and South Australia, as robust prices draw out supply. 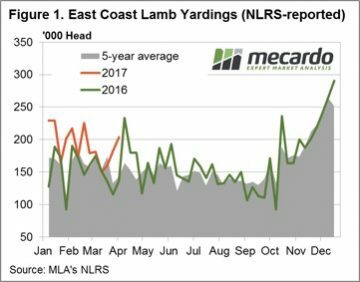 Figure 1. shows the rising trend over the last few weeks in East coast lamb throughput with a further 21,000 head added to yarding numbers this week to reach just short of 204,000 head. Since the recent dip in mid-March, lamb throughput has risen 35.4% in response to the firmer prices on offer at the saleyard. National price movements saw Restocker Lambs leading the charge, up 9.1% to $115 per head. In the remaining categories, we saw lamb posting gains of 3.5-5.5% on the week, more in line with the 4.1% increase displayed by the ESTLI – Figure 2. National over-the-hooks prices also firming for all categories of lamb by about 3%, while the National Mutton Indicator posted an impressive 8.2% lift on the week to close at 490¢/kg cwt. 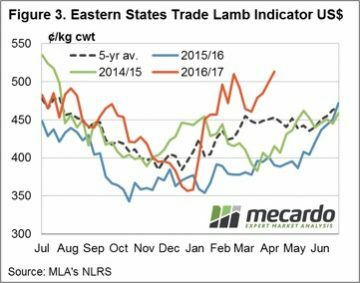 In US$ terms, lamb prices have reached a seasonal peak at 513US¢/kg cwt, this is only the second week it has been above 500US¢ this year – Figure 3. Despite the record local prices for Aussie lamb being received by producers at the moment lamb prices in US terms have been a lot higher. During the 2010/11 season our lamb in US terms reached toward 675US¢/kg cwt so at current levels it is still 24% off its all-time highs. The continued supply coming forward could see the recent upward momentum in lamb prices start to slow down in the coming weeks, particularly if producers are further encouraged by the firm prices on offer. The ESTLI may see some consolidation around current levels before the tighter supply into the Winter period should provide further support to probe above 700¢.